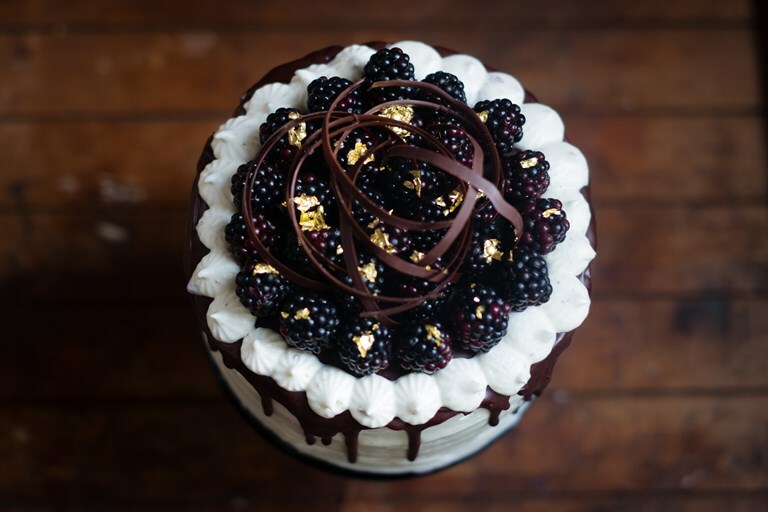 This stunning blackberry and marshmallow cake recipe is a true showstopper. Multi-layered, iced to perfection and perfectly piped with rosettes of marshmallow, this is the ideal bake for a special occasion. For tips on tempering chocolate for the decorations, use our How To guide. 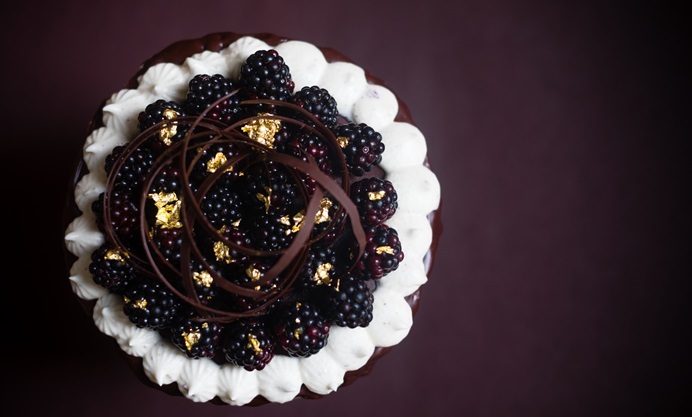 Everybody needs a great chocolate cake in their repertoire. It’s one of the classics and this iconic cake comes in many forms. The sachertorte, Devil’s food cake, gooey brownies, chocolate fondant and the black forest gâteau – the varieties are limitless. These cakes are embedded in the fabric of our lives, from a much needed mid-morning pick-me-up with a cup of coffee, a celebration cake, a well-earned treat or an indulgent way to end a meal. 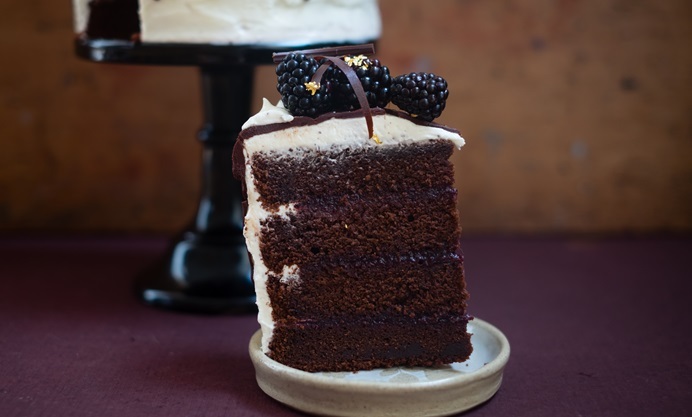 There’s a chocolate cake for all of life’s occasions, and the secret to creating a rich chocolate layer cake is cocoa powder. 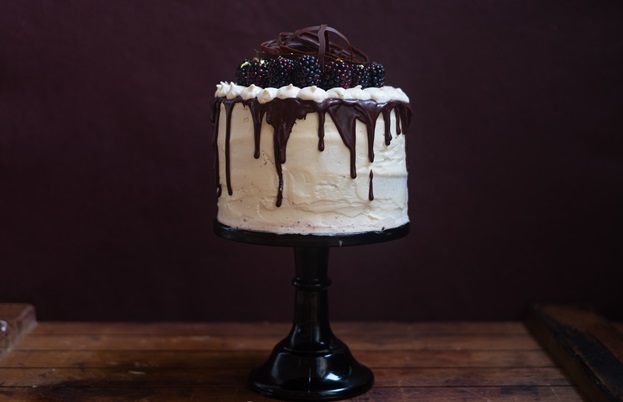 Unlike adding chocolate to your cake, cocoa powder will keep the finished sponge light, make it intensely chocolatey and give it a rich dark colour without affecting the texture of the sponge. The key is to use a good quality 100% cocoa powder that is unsweetened, this gives you a real chocolate hit in your baking. In this recipe the cocoa powder is combined with water before adding it to the batter, which helps to keep the cake moist and to disperse the cocoa evenly. 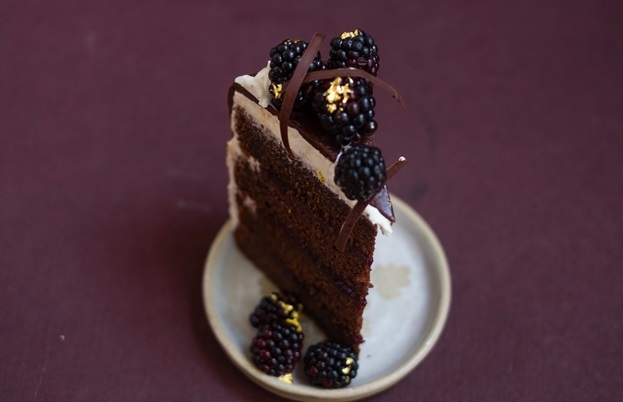 As blackberries are in season and they work so well with chocolate, a blackberry liqueur jam has been used to sandwich the layers of cake together along with fresh blackberries to decorate the cake. To compliment these intense flavours and to add a touch of lightness to the cake it’s coated with marshmallow buttercream. The final touch and to make this cake really special, there’s a gravity-defying drippy chocolate glaze spilling over the sides.